Thursday 2/16/2017. We had a good amount of rain yesterday but the survey team was able to pin the footers so we knew where our corners were. 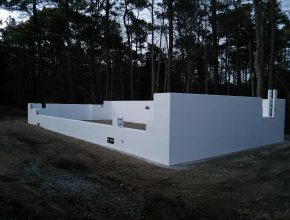 Today we received the Fox Block forms and started building . The first course takes a little time to set up but once that is done things move along pretty fast. Tomorrow things will take some shape as we will be setting up the bracing and continue to stack the block.